A top Iranian judiciary official says the death penalty hasn’t deterred drug trafficking, which is in fact on the rise. “The truth is, the execution of drug smugglers has had no deterrent effect,” Mohammad Baqer Olfat, deputy head of judiciary for social affairs, was quoted as saying by the semi-official Tasnim news agency on August 27. A man faces execution in Mashad, Iran. Olfat said he had suggested to the judiciary chief that rather than the death penalty, traffickers should serve long prison terms with hard labor. “We have fought full-force against smugglers according to the law, but unfortunately we are experiencing an increase in the volume of drugs trafficked to Iran, the transit of drugs through the country, the variety of drugs, and the number of people who are involved in it,” Olfat said. Iran carries out more executions per capita than any other country. Nearly 1,000 prisoners were put to death in 2015, most of them for drug trafficking. The United Nations has repeatedly praised Iran’s battle against narcotics trafficking but opposed its death penalty. The United Nations special rapporteur on human rights in Iran urged Tehran on August 26 to halt the execution of 12 people on drug-related offenses scheduled for August 27. 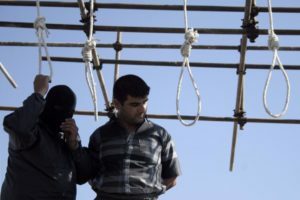 “It is regrettable that the [Iranian] government continues to proceed with executions for crimes that do not meet the threshold of the ‘most serious crimes’ as required by international law,” Ahmed Shaheed said in a statement.